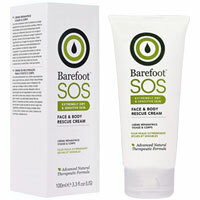 SOS Dry + Sensitive is a lifeline for sufferers with extremely dry, sensitive, irritated or uncomfortable skin. The products are suitable for all ages and for those who may be prone to eczema and psoriasis. The range is based on a nurturing complex of the cooling and soothing benefits of Stellaria with other pure natural moisturisers and the finest essential oils to deliver comfort, moisturisation and protection to problem skin. All the SOS Dry & Sensitive products contain a nurturing complex of active botanical extracts, including: Stellaria (Chickweed) - A humble wild plant which helps cool the skin to bring comfort. Purslane Bioferment - Helps protect against free radical damage. Burdock Extract - Contains antioxidant properties to help protect against irritation and redness.